I played Arkham Horror for the first time about a decade ago, but some of the people in my group just recently had their first experiences with it. This is not my personal Arkham Horror review, but rather our collective thoughts on the game. 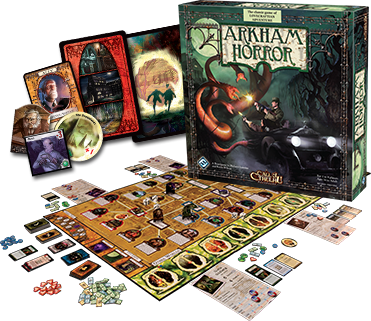 In Arkham Horror, you and your friends are investigators who will be exploring and defending the town against unspeakable creatures as portals to another dimension begin to open up all over town. You must work together to close the portals to keep the Ancient Ones from making it through. Arkham Horror was created by Richard Launius and Kevin Wilson and was published by Fantasy Flight Games. Like most cooperative adventure games, Arkham Horror begins with players selecting a character sheet, which includes all of the abilities, strengths, and handicaps of each character. Throughout the game, these abilities can be changed and temporarily upgraded through the use of spells, skill cards and other items. Players also randomly draw an Ancient Ones card at the beginning of the game to determine which one will be threatening the town for this particular campaign. 1. Each round starts with an Upkeep phase, where players do the “upkeep” actions on their cards and adjust their abilities for the current round. 2. During the Movement phase, investigators move around either Arkham City itself or an Other World. This phase can include actions like fighting, evading various monsters, and picking up clue tokens. 3. Next is the Arkham Encounters phase, where all investigators in Arkham either a) are pulled through the portal that is in their location, or b) they encounter something at their location. In either case, the player takes the actions indicated on the card. 4. Next up is the Other World Encounters phase, where characters who are in an Other World draw Encounters cards to determine what encounters they have, following any events or directions listed on the cards. Open a gate and potentially spawn a monster. Place any clue tokens necessary. Move monsters who are able to during this round. Activate any Mythos abilities that are on the board. Just about everything in Arkham Horror is resolved by rolling dice. The cards and each character’s abilities have a direct impact on how many dice are rolled to fight or to resolve cards. As the game continues, Doom Tokens are placed down, counting down to the inevitable return of the Ancient One. If you close the portals and prevent him from returning, you and the rest of the investigators have won. If all of the doom tokens are placed down before you close the portals, then he returns, and your only chance of winning is to defeat him. This is just scratching the surface of how to play Arkham Horror. If you want to see exactly how each game is going to play out, download this PDF of the Arkham Horror rules. The story itself is this game’s absolute strong point. If you are a fan of H.P. Lovecraft, chances are you will love watching this story unfold as you play through the game. In staying true to Lovecraft’s style, there is a certain sense of inevitability, and a constant question as to whether you will make it out alive. The overall presentation is excellent. There’s a ton of artwork, the board looks great, and all of the other bits blend in well and only add to the experience. The encounters are great. Each location has a random group of encounters, so you really never know what’s going to pop up. Arkham Horror has a massive amount of replay value thanks to all of the variety in the game. If you end up loving the game, this could be your group’s go-to since it always tells a new story. Most people will agree that Arkham Horror is a memorable experience regardless of whether they are big fans of the game or not. It feels like an epic experience, which most designers have a very tough time creating. While the story is the strong point of Arkham Horror, it can get very observational. The characters’ abilities and specializations do affect the action, but the players have less control over the direction of the story itself than my group was expecting. There isn’t as much player interaction in this game as there is in a lot of other co-op board games. All encounters, travels through portals and other actions happen to the characters individually rather than together. This makes it a cooperative game only in the sense that you are all working toward a common goal. The game is very long, sometimes taking more than four hours. You’re also going to need a very large table to be able to fit the board and all of the other components. We actually had to pass up playing a game one night because we just couldn’t make it work on the table we had. Arkham Horror usually tells a good story, but this is the type of game that my group will only play once in a blue moon. If you enjoy long, story-driven games, you’ll probably be a pretty big fan of this one. There’s a reason why it is still a very popular cooperative board game more than a decade after it was first released. I’m personally not a big fan of this theme, but I can see why Arkham Horror is considered a classic. For my board game group, we’d rather get our H.P. Lovecraft fix through Eldritch Horror or Elder Sign. Both games are shorter (especially Elder Sign) and are basically streamlined versions of Arkham Horror. There are plenty of Arkham Horror expansions, so there is a lot to add to the game if you end up enjoying it. UPDATE: All links have been updated to point to the Arkham Horror (Third Edition), which I’ve heard is a much improved version of this game. 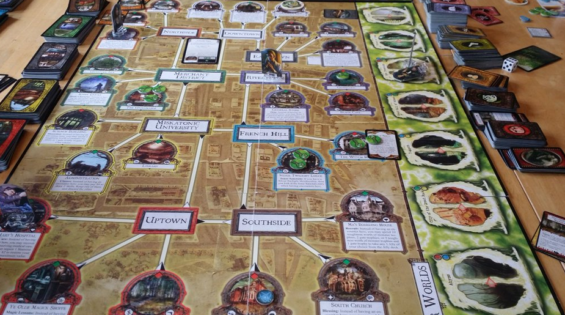 Thanks for taking the time to read our Arkham Horror board game review!